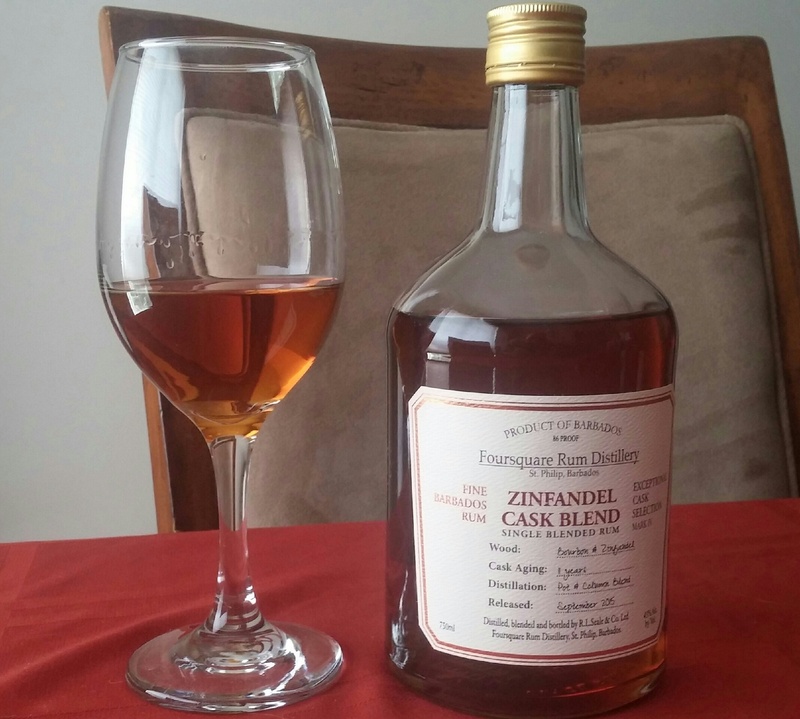 Have you found an online vendor selling Foursquare Zinfandel Cask Blend 11-Year? No added sugar or flavors. Everything is coming from distilling and barrel aging. I am interested to learn where foursquare is getting their zin barrels from. The nose is extremely heady and floral. In a blind tasting I would probably never guess wine but knowing it's there sends you searching and it is indeed detectable, floating up top in the back of the nose. The palate is rich and thankfully it's bottled at 43%. I can't help but wonder how the blender came to this ratio of bourbon and zin and how the line can be tipped one way or the other. I bought this along with the amazing 2004 so I could gain side by side perspective. The zin has far less charred white oak that so dominates the 2004! This gives it a multi dimentional quality and would be perfect pairing with a well rounded charcuterie platter. Bottom line, these R.L. Seale rums in the Foursquare line are stellar. Unless your favorite rum is El Dorado 12, in which case I'm truly sorry for you, your going to want to get this. A note on packaging... It's bare bones no frills screw cap bottling and thats okay. Whats inside truly speaks for itself. I bought this after reading all the rave reviews claiming this rum to be amongst the best available. I have to say on my first tasting, I couldn’t see what all the fuss was about. I almost thought it was bland. Having made no secret that DF Res is my personal favourite, this was a million miles away. However, after the second visit, I hope that I am truly now appreciative of what this “ true rum” offers. It’s naturally sweet, has little burn, leaves a long warming aftertaste that makes the throat glow. I do not add my normal 1 ice cube, just take it as it’s meant to be, nothing added. The more I try it the more it grows on me. 43% and still exceptionally smooth, nothing added, as natural as it can be. Nepijte jej, pokud netoužíte poznat opravdový rum. Nepijte jej, pokud neumíte ocenit opravdový rum. Takové plýtvání totiž bolí nás ostatní, kteří si otevřeme láhev, zaposloucháme se do Pavarottiho, zavřeme oči a představujeme si naše ideální místo. Na něm pak odpočíváme a necháme se unášet nádhernou vůní karamelu, marcipánu či muškátového ořechu na Zinfandelovém podkladu, jehož originalitu naše čichové pohárky dosud nepoznaly. Pomalu zakusíme doušek, který prohřeje naše tělo nejen dubovým nádechem se stopou skořice, ale mnoha dalšími členy tohoto precizního hudebního tělesa, jehož tóny si zamilujeme ihned po prvním poslechu. Pak za tento dar v duchu poděkujeme panu Richardu Sealovi, díky němuž přibylo v rumové bibli opět několik řádků navíc. This may be as good as it gets. Zinfandel Cask Blend has a stunning continuity between aroma and taste. No additives allow the master blender's art to shine, revealing a wealth of rich and complex flavors. I like Port more than I like Zin, and I love the Foursquare Port, so I thought for sure I'd like that more. But this is even better (imho) than the Foursquare Port! This has a wonderful pepper spice to it, and though not too sweet, it's not too dry either. Smells and tastes of molasses, pepper, toffee, marzipan, oak, and cinnamon. I also noticed a little Zin flavor after looking for it (because well it is a Zin rum). This is another fantastic aged rum from Foursquare. I'm REALLY impressed with the quality of their aged rums - especially for the low price of under $50 ($49.99 at Mission Liquor). Rum was one of my first favorite spirits.. However for past decade or so I haven't really had much, looking into other things. 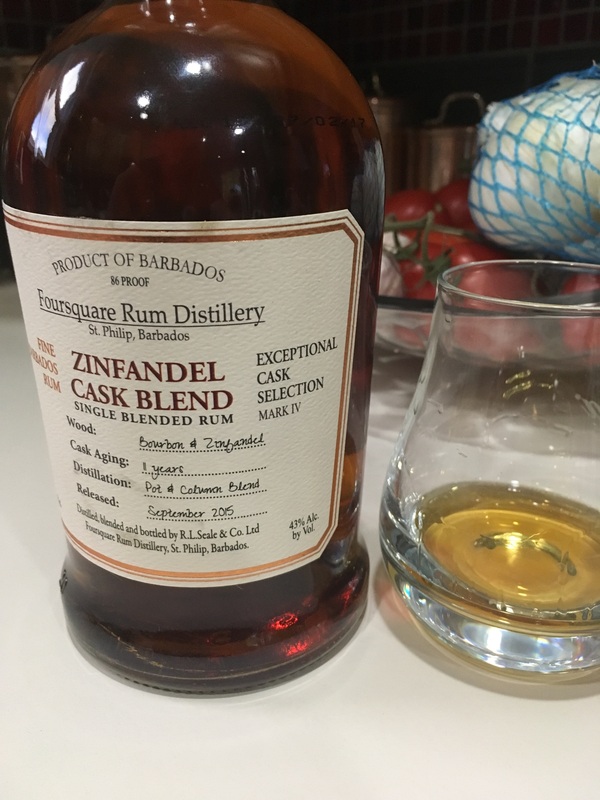 Recently I thought I should get back into rum but came across so many different unfamiliar labels and didn't really know what to be looking for and what was just hype. So I was at TJ and saw this one, and the price was decent and a quick phone websearch showed it was supposed to be OK. Brought it home and wow - balance, beautiful fruit aroma (maybe a slight suggestion of black cherry from the zin), smooth flavor, alluring sweetness, and balance again. blown away, and brought me back to rum. Took more than 20 minutes for the big alcohol aroma to dissipate. I find this common with new bottles. That's not a detriment, just an observation. Nutty, oak, a little hot in a good way; the grapes are there, on the sides of the tongue. Long finish at the back of the mouth. Walnuts? A solid pick, if you like them dry. This is Seale's Zin-Cask rum and it is out of this world. Whereas the port-finish offering from last year overpowered the rum rather than added to it, this Zin finish marries so easily with the rum to produce a luscious bouquet and delicious flavor throughout the tasting. It's very dry, yet full of fruity overtones and spicy goodness. Excellent product. Straight up all the way. I like Foursquare Port cask 9yo,this one is one step more mature,the Zinfandel adds touch of specialty. I was apprehensive to give this a try. No added sugar or flavors, sounds bland. Wow was I wrong. Subtle taste, great aroma, smooth finish. Overall a excellent rum to drink neat. 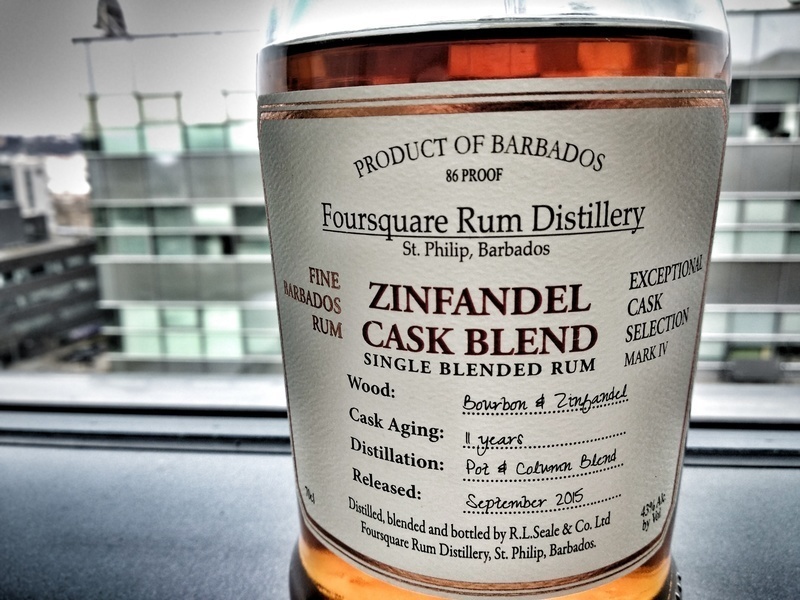 Foursquare Zinfandel Cask Blend is very impressive rum masterpiece. 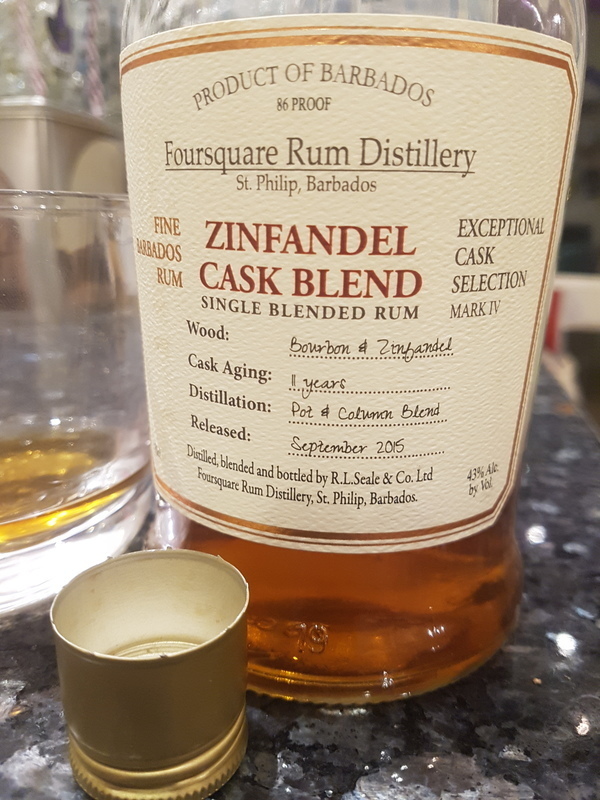 Simply brilliant rum for the price, but just remember that it is different from “standard” rums and I would say it is only enjoyable for experienced drinkers. The Zinfandel influence is very prominent and adds some real intrigue. If you like British style rums go ahead and give a try to this Bajan rum. 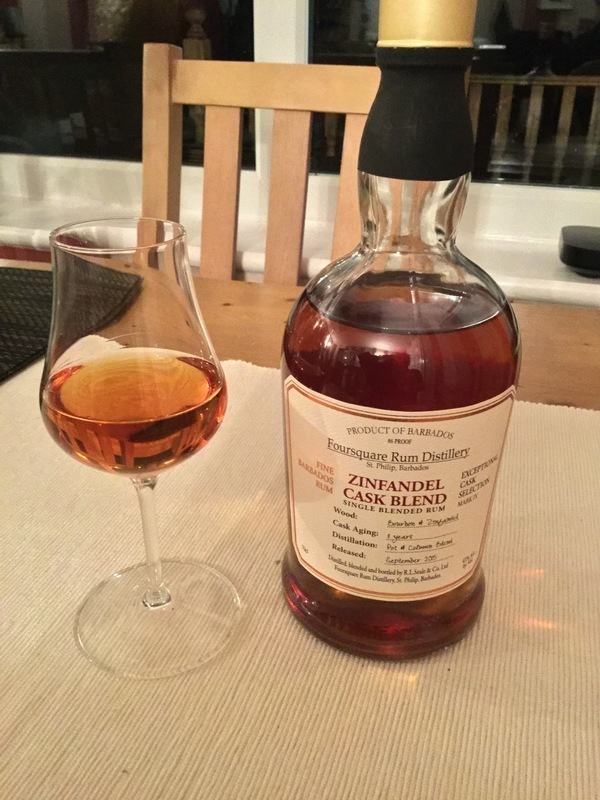 The 4th in the Foursquare special cask editions, the Zinfandel cask aged is another winner. Blended between pot and column still, and Zinfandel and bourbon casks it has not been sweetened or coloured. It comes in the same bottle as its predecessors and the Doorley's rums, meaning it has a screw cap, belying the quality in the bottle. Mouth: gorgeously warming, fruity notes from the Zinfandel with warm woody tones and a hint of bourbon. Sweetness: 2-3/5; hard to call, it is all from the bourbon casks, no added sugar, but it does not feel dry. Summary: As a specialist rum this is a total bargain. Drier than most "top sippers" it excels in purity and quality. It is a limited edition - get some while you can!! I loved the port cask and was looking forward to trying another Foursquare classy rum. It didn't disappoint... Beautiful fruity aroma upon opening , then after leaving in the glass for 5 mins my first sip... amazing taste , fruit , wine cask and a little pepper. Its dry but not too dry and the aftertaste is the best I've experienced so far... just great rum ! Vintage cask next. He is King Midas, in my opinion. I will buy anything he makes and almost certainly love it. Whoever said walnuts at the end nailed it. I liked their Port finished rum and wanted to give this one a try as well. I like it better than the Port and I really like the Port finished. 1er rhum découvert de chez foursquare, après un nez déroutant, une explosion de saveur en bouche, du miel, du fruit et une final sèche et relativement longue...que demande le peuple ? Du rhum bien sûr. ..
A real surprise here. lovely bold and traditional rum flavour with just a hint of the pepper from there zin. Ver well balanced rum, I will be using this again for sure. Better than the Doorley XO and the Seale 10 if that helps. Helt utan socker tydligen. Jättegod och söt, men inte för söt. This is combined of two rums: one aged for five years in bourbon and then six years in ex-Zinfandel wine casks, and an 11-year-old matured full term in bourbon casks. These were then blended together and bottled in September 2015. Fruity and full of vanilla notes. Drier with no added molasses or sugar. Great rum. My second kind of a Foursquare / Richard Seale Rum (first one was the port finish). This rum just taste awesome and is interesting and well balanced. I am going to buy more of the rums from Foursquare, and then its just great that they are reasonibly prized aswell. I am in love with this rum. 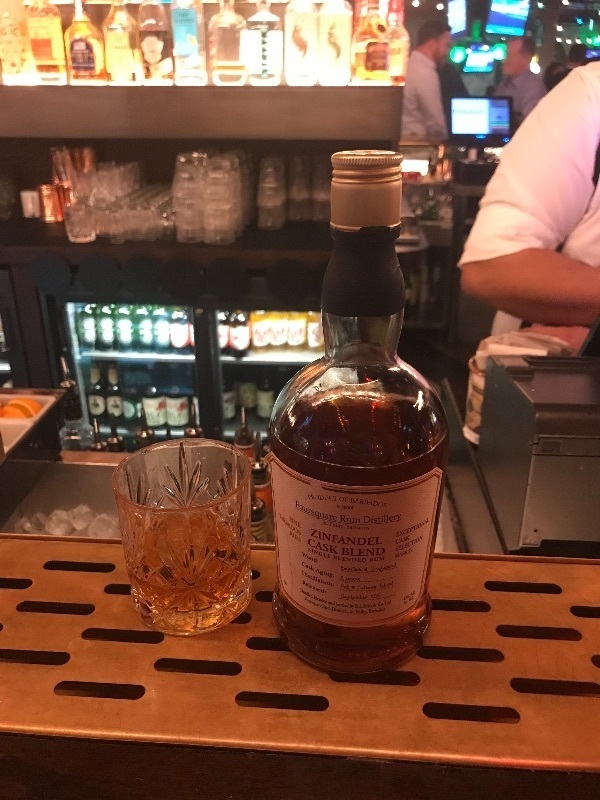 I first tried it at the 2016 California Rum Festival, along with the Port Cask Finish and a couple other Foursquare offerings (connected with R L Seale, so you know it's good right off the bat). Pour this in a large snifter or cabernet glass, and take in the aromas of wine barrels. If you've never visited a winery's barrel-aging room before, this may be the next-best thing. The double-aging in bourbon (first) and zinfandel (last) casks works really, really well. In the mouth, this rum is smooth, with a satisfying oak bite. The flavor is complex, with characteristic Bajan sweetness, but off-dry overall. It strikes a really nice balance. I've read that some caramel color was added, but no other additives or sweeteners, allowing the rum to shine on its own. And shine it does! I've given this as gifts to two special folks for the holidays, and only wish I had one for myself—but I've got several other bottles to get though, first :). I've been waiting for this one to come to the states after loving the 2004 Single Barrel and the Port Cask and I wasn't disappointed. It shows how you can make a smooth and complex tasting rum without adding tons of sugar and additives and just letting the cask give the rum its smoothness. I'll definitely be buying this one again.